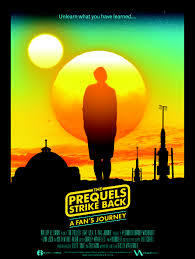 In case anyone has enjoyed the content of this blog, or the content of my book, and is looking for the next step in the journey, I cannot hesitate to suggest Bradley Weatherholt's The Prequels Strike Back. This is a brilliantly crafted film about "a certain point of view" on all things Star Wars. It takes a very in depth look at many subjects which usually only score a casual glance at best. This isn't just about the prequels. As I have tried to do so often in my work, this is an analysis of Star Wars, fandom, George Lucas, cinema, and just a lot of philosophy and psychology and myth and metaphor in general. It's about art and perception and the various narratives we use to guide our lives. The documentary never fails to be honest, insightful, and as objective as anyone can claim to be when evaluating a subject as passionately experienced as Star Wars. It boasts a wonderful gallery of spokesman, probably Mike Kilmo of The Ring Composition fame being the most prominent. Which is wonderful, because he is so knowledgeable about so many things. All in all, the film begs the simple question of how much more interesting all of this would be if we looked at things from "a certain point of view." Another point of view. I've heard the director on numerous podcasts, including one of my new favorites, The Cantina Cast. One of his primary mission statements seems to be just positing how much more interesting the saga gets when one rises about the online fanboy chatter and is willing to take their first step into a larger world of possibility. While we're at it, that is just a great stepping off point for just about everything in life. As for me, I was graciously offered an interview in The Prequels Strike Back. However, the filmmakers couldn't make it to Atlanta, and I just couldn't make it work at the time either, so I am not physically in the documentary. However, my book is certainly featured, as well as a lot of ideas that I have been shuffling around for over a dozen years now. Maybe it is egocentric and un-Jedi like, but I will say I feel The Star Wars Heresies casts a long shadow over all of this. Personally, I'm still enjoying retirement from official fandom, and just kicking back and letting it all be what it is. The transition to Disney has been better than I had anticipated, with a new season of Rebels about to launch, and Rogue One on the horizon. I am absolutely loving those trailers! And yes, my friend and I already have tickets for Star Wars Celebration in Orlando next year. Maybe I will see some of you there, which is always a pleasure. Perhaps I'll be writing about Star Wars some more before it's all over. I'm working on another YA fiction project, which I didn't think I'd ever do again, but here we all are. My next big Star Wars event will be Star Wars Reads Day at the library I work at. We have registered to win a day with Pablo Hidalgo, and if that happens, I will certainly post about it! 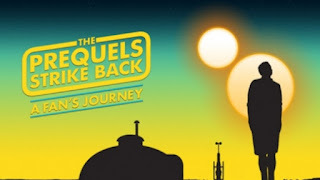 Anyway, The Prequels Strike Back are available on YouTube and Amazon to rent and buy, with the DVD and a big screen release coming next month. If you enjoyed all my stuff, this is clearly the next step, so please go support this film. Lacking any other avenue to laud you I must hope that this transmission reaches you. You have saved The Prequels for me. Literarily. I've growing increasingly interested with Myth as the answer to the current existential crisis (personal, state/nation, world), and it simply amazes me how powerful myths can be if only we would treat them like we treat technology. In fact, in some ways mythology is way more tangible - it seems to be built into our DNA. I wish I could convey, fully, how the introduction alone - what with its discussion of poetry - helped me come to terms with the ambiguity of life. It made me realize that life is not a story its a poem - and it requires my interaction to be meaningful. From there it has just been an scale to the heights of both Star Wars and Mythology. I am simply amazed at how deep the mythology is in Star Wars. I thought it was mere surface gloss. I am so grateful you took the time to point out how and why it is not. I know fans can be hard on people, and I think generally they are much like Dooku who would not give to the Will of The Force, I hope this letter reaches you and gives you pleasure as your book has done for me. Okay, maybe a year too late, but I did check in on the blog. Thank you, kind sir.That makes it all worth it. But honestly, I relate. That's why I wrote all of that to begin with. Poetry does sit so well in the soul. It provides a three dimensional look into a sometimes two dimensional world. I hope your journey has continued and is going well. Thanks again. To me, this show is something special. And that's not primarily because I think it's good - though I DO think it's good - it's because with this show, when you're in your forties like me, there's a huge nostalgia factor involved. megashare9 Let me explain. When I grew up in the eighties, losmovies we didn't have TV-shows like 'Stranger Things'; we got 'Knight Rider', 'Alf', 'MacGyver' and 'The Fall Guy' instead (and boy did I love those shows!). But we DID have movies that were a lot like 'Stranger Things' - and books. The main factor why we loved their movies and books was that kids roughly our own age figured so prominently in many of them. King wrote 'Firestarter', 'It' and 'Stand By Me', and Spielberg either directed or produced (via his company Amblin) 'E.T. ', 'The Goonies' and 'Gremlins'. As a lifelong Star Wars fan without regret or apology, this blog recognizes that many of the truths we cling to depend greatly on our own point of view. As such, it offers commentary on any number of issues on the Star Wars galaxy from within, as well as on the fandom from without. The Star Wars Heresies is all about using that galaxy far, far away as a lens through which we can explore any number of fascinating topics, hopefully in a way that hasn't really been done before. It may be blasphemous to the more dogmatic of fans, but at least it won't be boring. 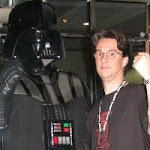 I have had Star Wars editorials published by Space.com, Suite101.com, SciFi Dimensions, as well as The Forcecast.net and TheForce.net. My big project is a book of academic criticism on Star Wars in general and the prequel trilogy in particular. It was published in 2013. The Star Wars Heresies Book - Order Now! Content owned by Paul F. McDonald, Pics by Lucasfilm Ltd. Awesome Inc. theme. Powered by Blogger.